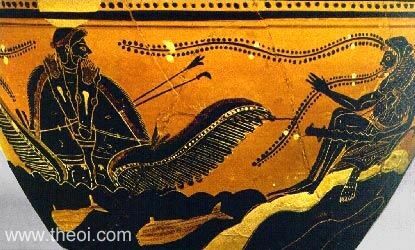 Heracles, seated on the banks of the River Oceanus, shoots arrows at the sun-god Helius. The god is crowned with the aureole of the sun and drives a chariot drawn by a pair of winged horses. A pair of arrows protrude from the chariot. The hero wears a lion-skin cape and holds a club and bow.